Fall is such a beautiful time at Walt Disney World! Enjoy this autumn photo, perfect for an October calendar page! I’m linking up with Focused on the Magic’s Wordless Wednesday Blog Hop, currently hosted by Disney Day by Day, while Deb undergoes chemo treatments. I’m keeping her in my prayers as she focuses on her healing for the next several weeks. Take care, Deb! What is your favorite thing about Fall at Disney World? 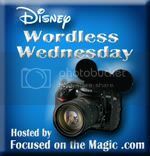 Thanks so much, Deb, from Focused on the Magic and Sean, from Disney Day by Day, for hosting Wordless Wednesday! Check out the other posts on my site while you’re here, follow me on Pinterest, Twitter, like me on facebook, and/or subscribe to my blog. (You’ll enjoy Daily Doses of Disney on my facebook page!) Then, don’t forget to click on the Wordless Wednesday icon to check out more Disney blogs and their October Calendar Picture posts! I love the parks in the fall, perfect shot with the castle. Thanks for sharing and linking up. Thank you for hosting, Sean!